AustralianLight - Landscape Photography is my new site with my good mate Bernie. If you have found my blog posts useful over the years, then how about giving us a hand to promote AustralianLight. We are doing everything we can to get our australian landscape photography out there and guess what..... it's bloody hard work!! So please visit the gallery and if you like what see, share it with your friends. Well the fact is.... physics has not changed! Light still travels in straight lines, is diffused and bounced just like it always has been, sees it's intensity drop to 1/4 as the distance doubles and can only be made "soft" in ONE way..... by making it BIGGER in relation to the size of the subject lit. This is the principal behind both bouncing and diffusing our flash units. Bounce the flash off a ceiling or umbrella and the light source becomes much bigger. Diffuse our light source through a much larger attachment like a light box and it becomes much bigger. Of course size is relative to distance... ie: a 100cm soft box will give lovely soft light when 50cm from your subject, but put it a 5m and it starts to become "relatively" small to the subject and the resulting light will be much harder. Basically these "diffusers" would be better off called "bounce" attachments, as the relatively small increase in physical size does little to provide a softer light. Instead, they spread the light in all directions, so that it can bounce back off walls and ceilings etc. The short answer is.... not very well. As I stated earlier, the relatively small increase in physical size does little to provide a softer light and if there is nothing to bounce off there will be no secondary "fill". So in effect these diffusers make things worse in these situations, as they waste light that could otherwise be used to light the subject. I have seen demonstrations where one flash attachment is used to fill a whole ball room of people! Yes I have seen those too, but don't be fooled by what information is conveniently left out. In the demonstrations that I have seen, the photographer avoids mention that a much wider aperture or higher ISO has been used. When this is done the pre-existing ambient lighting becomes a very large player in the exposure. So the result is NOT as much about how good the attachment is, but equally (if not more) about the different photographic technique used. In the case of a wider aperture, the result comes at the loss of DOF (depth of field) and this is not desirable when trying to keep large number of people in focus. None! All the diffusers work given the right situation (normally enclosed spaces), but no "one" is the best at everything. It is my advise to have a number of techniques in your bag of skills and apply the best one for any given situation. 3: There are many diffusers available on the market today and regardless of the price and makers claims, you can achieve the very same results using everyday items as simple as a business card, tracing paper or even your hand. The following image is to give you some idea of the results from various techniques.. This is my "home made" diffuser.... a 40 cent sheet of tracing paper makes about 6 and the results are every bit as good as a popular $100 unit. Yes, very good info Russ. how close were you with the homeade and I was also curious if this worked because of the bouncing and not the diffuser (I thought that's what you said.) In other words your diffuser redirected the light to bounce and made the nice image. thanks. Distance was approx. 1.5m and there is a 3m ceiling. This works thanks to a combination of the bounce & the diffused light. The diffuser has not "redirected the light" to the bounce and the open top sees the direct light go to the ceiling as normal. 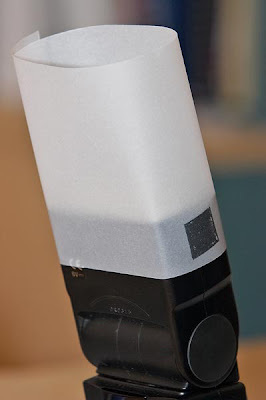 The wider part of the flash's beam is diffused by the tracing paper and this light illuminates the subject directly, as well as by bouncing off any other objects nearby. As you can see from the sample, the 'bounce only' image has unnatural looking shadows under the eyebrows and chin and the image generally looks a bit "flat". The Home Made sample (bounced + diffused light) however has these shadows filled by the additional light and the image seems to "pop". ALL small on-camera diffusers rely on bouncing the light and there is NO exception to this, regardless of what the Snake Oil Salesmen tell us. There is only ONE way to soften a single light without using bounce techniques and this is to make the light source large.... REALLY large when compared to anything that attaches directly to the on-camera flash. Please see the "update" image posted above, as it is an example of a relatively large single light source. In this outdoor situation, any and all small on-camera flash diffusers would have been useless, as there is nothing to bounce the light off. So in this case the flash was fired through a 36 inch translucent umbrella. The exposure was also set to make use of the natural ambient light to provide the backlighting and background fill. All images and text are Copyright: Russell Stewart, PixelPix P/L. Powered by Blogger.